I am not a sports shooter, and I rarely have opportunities to shoot action or sports photography. 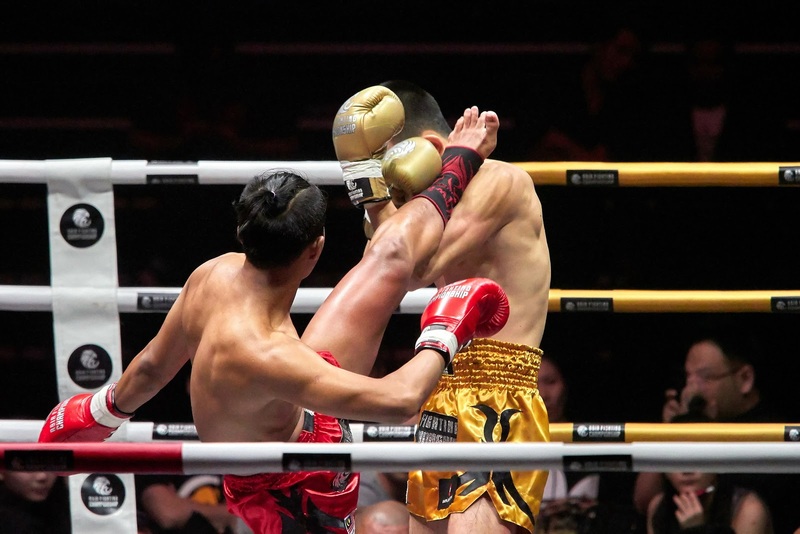 My experience in such fast-paced shooting is limited and I expected a lot of failed shots going into the Muay Thai fight. It is extremely crucial to know the game well so you better understand which moments to aim for and what to avoid during the shoot. I did not have any particular objectives set out before hand and I went in with the intention to nail more keepers this time (compared to half a year ago). I packed the M.Zuiko 12-40mm F2.8 PRO and 40-150mm F2.8 PRO with MC-14 1.4x teleconverter to increase my chances at this. 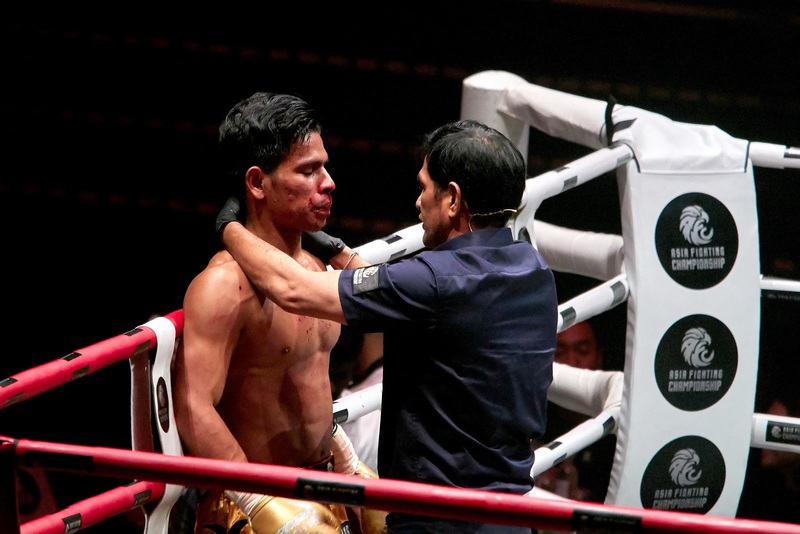 There were 11 fights – no tap outs meant all fights had to end with a knockout or when time ran out. Due to a large group of photographers, I was only able to shoot from the ringside for one match. I used the M.Zuiko 12-40mm PRO for the ringside shots, and the rest of the shots were taken with the 40-150mm F2.8 PRO with MC-14. My biggest challenge was the inability (my own weakness) to predict what the fighters were about to do, or where they would be moving to. Poor understanding of the game was probably a result of insufficient homework before the fights. No matter how great the camera performs, if you fail to frame your composition according to the movements of the fighters, you will end up losing a lot of shots as fighters move out of the frame constantly. After the first fight, I found myself starting to understand the movements better and I managed to follow the fighters more effectively. The lighting was not great either, with harsh and uneven light from the top. While the lighting was generally bright, it was still a challenge to shoot fighters moving at blindingly fast speeds. 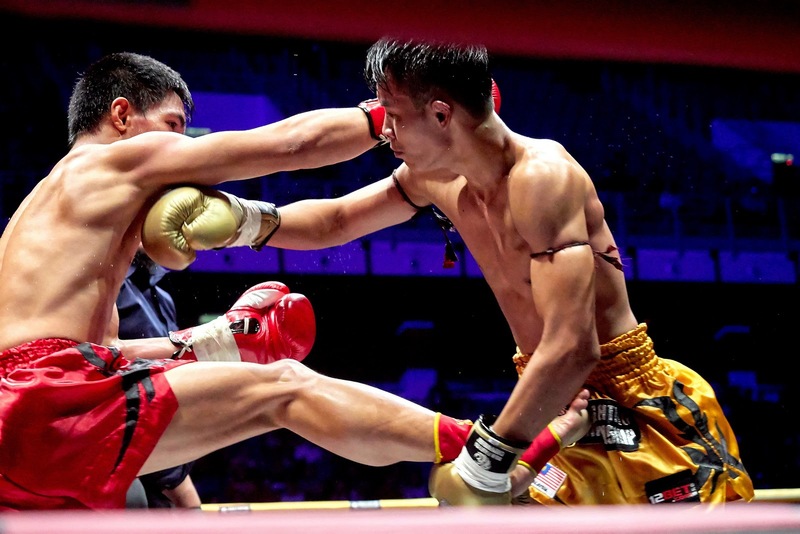 A shutter speed of 1/500 second was barely enough to freeze the rapid motion of the fighters’ punches and kicks. Yet at 1/500 second shutter speed I was already at ISO3200 and about one stop underexposed. I was shooting at 210mm (which was the longest telephoto reach I had available) and was wide open at F4 the entire time. I refused to push the ISO to 6400, knowing I would regret this based on my experience from past MMA events. Autofocus on the E-M1 Mark II was surprisingly reliable. I set the AF area to “cluster” allowing the camera to detect any subjects that moved within the frame and automatically track that moving subject. I was shooting at burst with mechanical shutter at a maximum speed of 10 frames per second. I was aware that if I used the electronic/silent shutter I could go as fast as 18 frames per second, but I did not intend to come home with twice the amount of photographs from a non-commercial shoot. The idea of going through thousands of photographs at the end of the day is dreadful. Nonetheless, the 10 frames per second was sufficient in capturing critical moments during the fight, and the continuous AF performed admirably, resulting in very high hit rates. 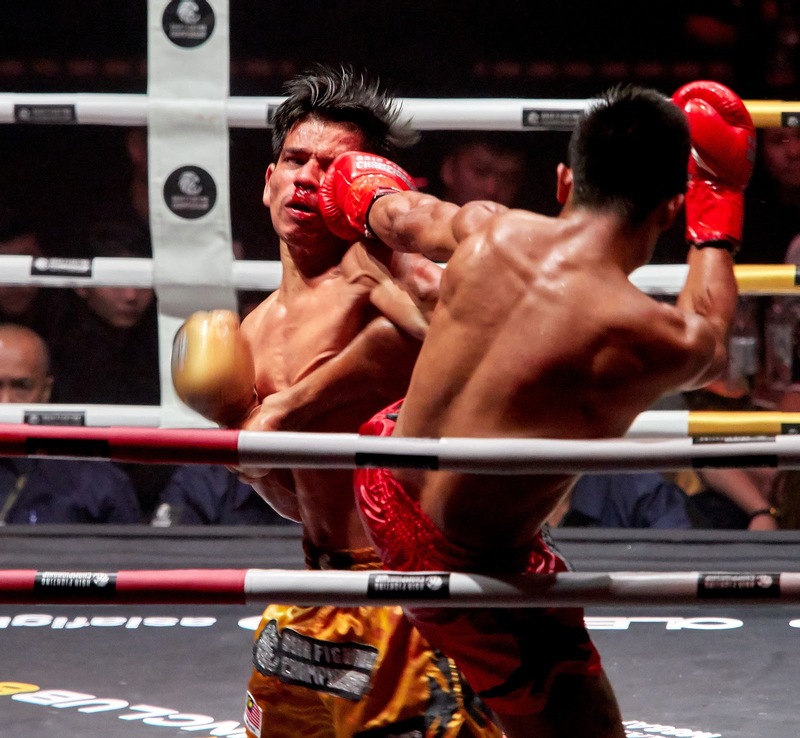 I am hesitant to admit this, but in sports photography such as Muay Thai, efficiency of the AF on the camera makes all the difference. I am not discounting the importance of general photography skills, discipline and technical handling of a camera – they still matter. However not having a camera fast and reliable enough to nail the focus instantaneously will just get you more misses and a ton of frustration. I can honestly say that if I had used the E-M10 Mark II or the older E-M1, I may have still got some keepers but the failure rate would have been higher. I felt significantly more confident using the E-M1 Mark II and have the shots in this article to prove it. The only times I missed the shot was due to the referee and official videographers blocking my line of sight, or the fighters not being in ideal positions. This is a case where your choice of gear will determine your success of the shoot. Another aspect of the camera that I may have overlooked during the shoot was the EVF and live view LCD response. Many years ago photographers constantly expressed their concerns on the electronic viewfinder lag that proved to be difficult to work with when dealing with fast action shooting. A DSLR was still preferred generally for the lag-free viewfinder experience. Using the E-M1 Mark II’s EVF, I didn’t once experience any noticeable lag. As I was using the mechanical shutter there was some blackout between frames but it did not obstruct me from following the movements of the fighters and would be comparable to a DSLR. Given that EVF technology can only get better and better with new iterations of cameras, the non-believers should really give EVF a chance! 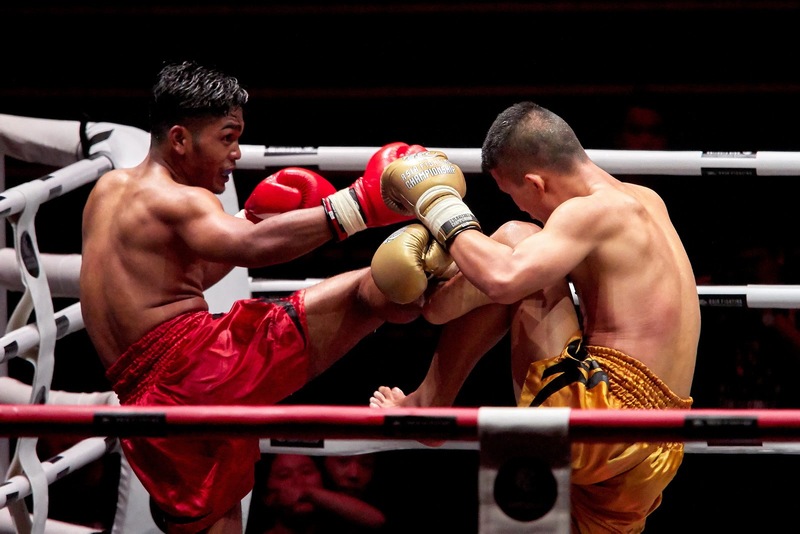 Shooting Muay Thai was a fun and eye-opening experience. I honestly cannot believe parents brought their kids to the show – there was this young boy shouting “I SEE BLOOD” next to me. The feeling that this was unnecessary violence and gore aside, I have come to appreciate the continuous AF capability of the E-M1 Mark II (which I rarely use). When the camera automatically tracked the movement of the fighters, all I had to do was ensure my framing was right when the shutter was pressed. Nailing some “a-ha” shots was quite an incredible experience itself. I look forward to attending more future fights! Wow! Excellent shots. Kudos Robin Wong. Curious if you’ve ever tried to mount legacy 4/3 on the E-M1ii? I’m seriously considering the 50-200 SWD, do you think it could handle this type of action as well? Well done, Robin. Crisp contrast and color. One would never think the lighting was less than ideal. Ah that makes sense. I was using mechanical shutter this session so no issue with rolling shutter this round. You are very right in the difficulty of predicting the action in sports new to you. Still you came back with good photos! I’ve had the same problem with performing flamenco dancers. Do you think more than 10 frames per second would make a big difference? higher frames per second will only help to get actions you successfully frame. If the subjects (dancers/fighters) move out of frame, no matter how quick the camera is, we still get missed shots! Then your pictures are not cropped! When shooting wildlife I press the shutter at any sudden, unexpected action but here I have the benefit of space around my subject. You must have good reflexes Robin! It would be really nice to cover something less aggressive! Thank you for your post. I am always trying to differentiate what constitutes user inexperience vs limitations of the camera. Articles like this really help. Thank you. In this case, the camera plays a more vital role than shooting expertise. Let’s face it, if the AF hunts even just ever a slight bit, the action would have been missed! I would normally assume an event like this belongs to the larger format, but these look good for web viewing and will likely be fine in print. It would be good if Olympus could squeeze usable ISO 6400 out of a future Four Thirds Camera. I am sure technology will just get better in time. I was hoping it will catch up faster too, hopefully soon in their coming model. No punch intended! That was a great line.